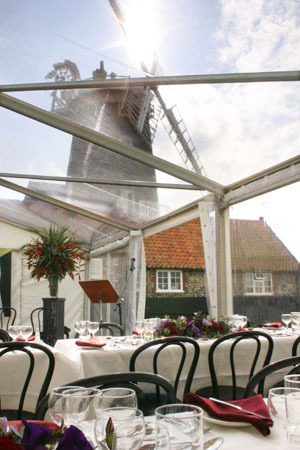 Mayfair Marquees is an established company based in the heart of Norfolk, which has been trading for over 20 years. We can supply marquees for small dinner parties to corporate hospitality structures. Our marquees are made by the leading manufacturer Walu, based in Strasbourg, France. All our marquees are clearspan and can include insulated solid sides and insulated solid glazed panels. Our marquees are designed with no internal poles and have an integrated cassette floor system which locks in with the marquee and allows us to give a flat, level surface; so as to utilise your space more practically. To discuss your requirements, marquee hire costs, or to order a brochure, please contact us.